Compound Butter for steak is probably one of the easiest ways to add a burst of flavor. Having a little roll of this herbed butter in your fridge can rock so many of your dishes. 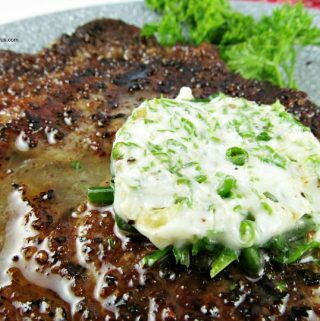 Compound Butter for Steak is easy to make and it can be kept handy to drop on your favorite steak. But it’s not just for steak, try it on veggies, pasta or on a baked potato. It’s delicious on most of your grilling favorites and if you are like us here on the ranch, we are doing loads of grilling this summer. A pat of this butter on your favorite cut of steak is just heavenly. 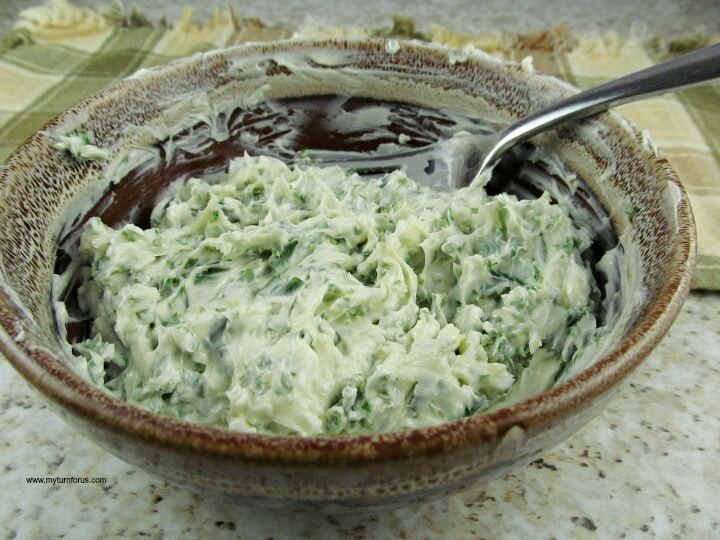 This Herbed Butter can be kept in the fridge for up to a week or can be cut into pats and frozen for longer storage. This post may contain affiliate links which means if you purchase something that we have mentioned, we will receive a small commission at no extra cost to you. We only endorse products we truly believe it. 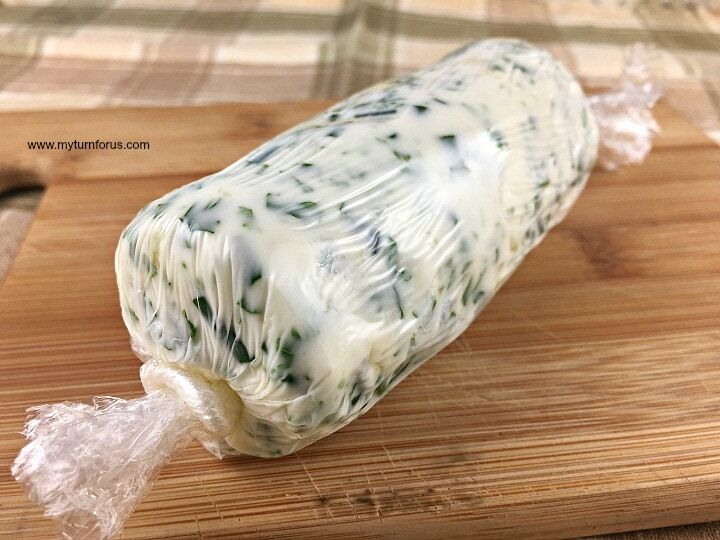 I make this Compound Butter for steak using a variety of herbs but I always use fresh garlic cloves. Garlic and Butter go together like salt and pepper. And it’s such a perfect combo. 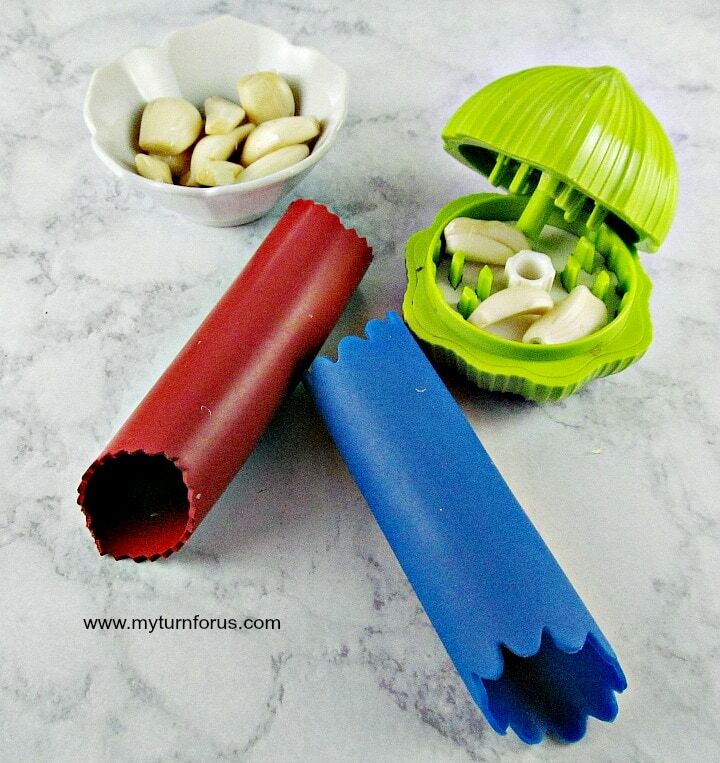 Remember one of the easiest ways to peel fresh and mince garlic cloves is this combo of a Garlic Peeler tube and Garlic Chopper or Mincer . Place the unpeeled clove into the Garlic Peeler Ruber tube and roll with your hands putting a little pressure on it, dump out the peeled clove. Then place the peeled cloves into the Green Garlic mincer, place the top on it and using a little pressure to push the sides together, spin the top. The cloves will come out perfectly minced each and every time. Easy Peasy. Also, we use fresh parsley and fresh chives out of the garden. These herbs can be purchased at your local grocery store but it’s so much cheaper to grow your own. But if you don’t have fresh herbs, read here on how easy it is to make an indoor herb garden. We start this compound butter taking a stick of butter, (1/2 cup) and letting it come up to room temperature. It doesn’t work very well if you melt it, it just needs to be room temperature soft. We gathered fresh chives, fresh parsley and a couple cloves of garlic. Chop the herbs, this can be done using Herb Scissors and then mince the garlic cloves. Add the herbs and garlic to the softened butter and mix with a fork. Make sure the garlic is well incorporated. Spoon the mixture on a piece of clear wrap and close the wrap. Gently form an elongated tube of butter mixture. Then twist the ends of the wrap and tie off. Place the tube of butter into the refrigerator and allow to harden. Also, before it completely hardens, it can be taken out and rolled gently with your hand to make a perfectly round shape. 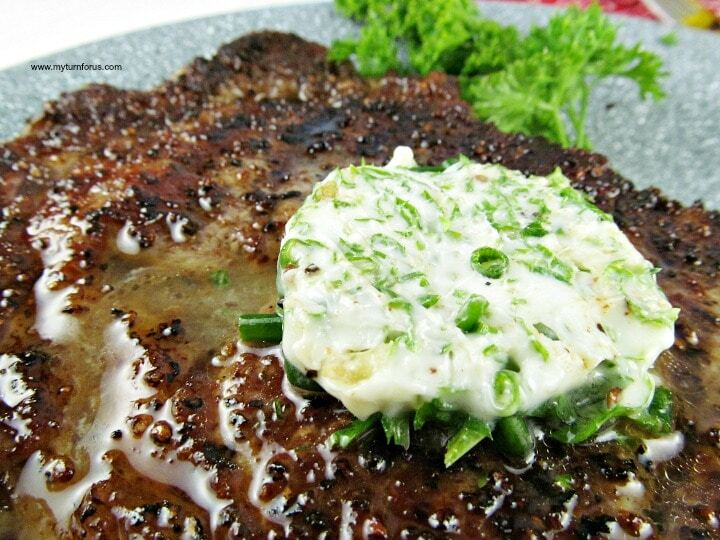 As you are cooking your steak, remove the butter from the fridge and sliced into round pats of butter. And as soon as the steaks come off the grill, place a cut pat of butter on the top and allow to melt over each of the hot steaks. 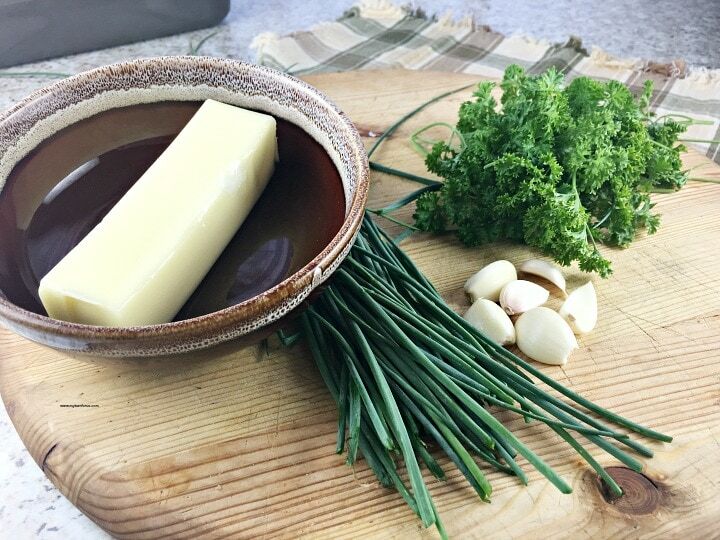 This Parsley and Chive Herb Compound Butter for Steak Recipe is my favorite. And it’s a great place to start a Herb Butter addiction of your very own. Place mixture on a piece of clear wrap, roll into a log shape, twist ends to seal. Or butter can be shaped into hearts, logs or even butterflies. 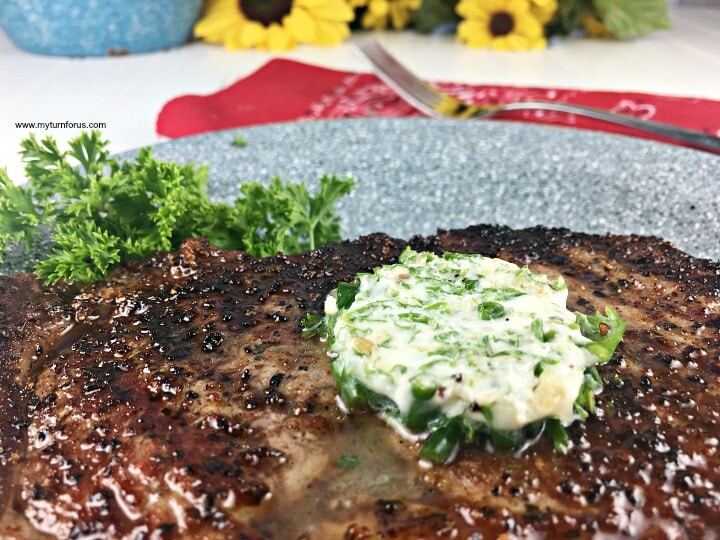 I love herbed butter – especially on grilled steak!! Mmmmmmmmm!